Long nose pliers, all in one screw driver and tire gage with four tire caps. You never know when you will need a quick fix. Did you know that one of the biggest fuel wasters is low tires. Check them once a week and save big. 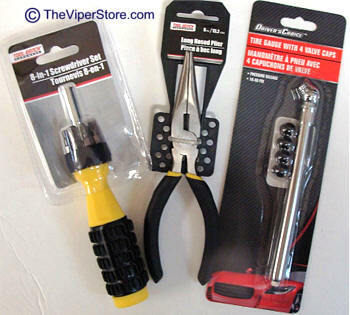 Includes: Long nose pliers, multi-head screwdriver, tire gage with extra valve stem caps.